St. Vincent de Paul parish cemetery is situated right in the middle of the city-owned Clifton Park Golf Course. And though it hasn’t had a burial in more than 50 years, it is home to more than 2,000 former parishioners of ours as well as of St. James and St. Leo parishes. Through those years of disuse, it suffered from desecration and was bulldozed by the city. 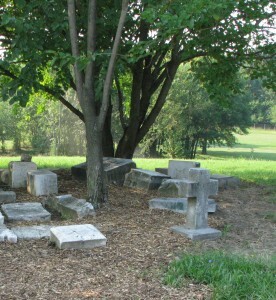 Descendants of those buried there, however, formed an independent nonprofit, the Friends of St. Vincent’s Cemetery, to restore the grounds and reestablish dignity. The history of this cemetery is an intriguing story that parallels the fortunes of St. V itself. Thirteen years after St. Vincent de Paul Church was established, its Trustee Board was authorized by an act of the Legislature passed in 1853 to sell the closed cemetery at St. James Church and buy another burial place. For $1,350, it purchased five acres just outside the eastern limits of the city and a little north of the Belair Road. It had been owned by Johns Hopkins himself as part of his summer estate (which was called “Clifton”) and was purchased directly from him. He left the rest of the estate to the city in his will, and it became Clifton Park. As was the practice in the 19th century, burial fees included only the opening and closing of the gravesite, with continuing care being the responsibility of the family. Consequently there was no endowment for perpetual care. St. Vincent soon became the largest parish in the Archdiocese, numbering more than 7,000 communicants, due to nearby upper-class English and waves of Irish immigrants. However, the parish saw changes at the end of the 19th century. The English had moved further out (some as far as Mt. Vernon), and the new immigrants were now largely Italian. By the time of the 20th century, however, the neighborhood and the parish had fallen on hard times. The last of the Irish and the first of the Italians were moving up and moving out. Poor folks continued to stream into the neighborhood, but the next two waves of population were Jewish and African-American, bringing few new members to St. Vincent’s Catholic parish. The parish drew few parishioners from its neighborhood. Meanwhile, city development surrounded the cemetery property. Few families assumed responsibility for the grave sites of their ancestors. St. Vincent, considerably smaller and strapped for funds, maintained a part-time caretaker on-site through the 1960’s, but could not protect the graves from increasingly-common vandalism and desecration. Nor did the parish have the funds to move the graves to more suitable grounds. 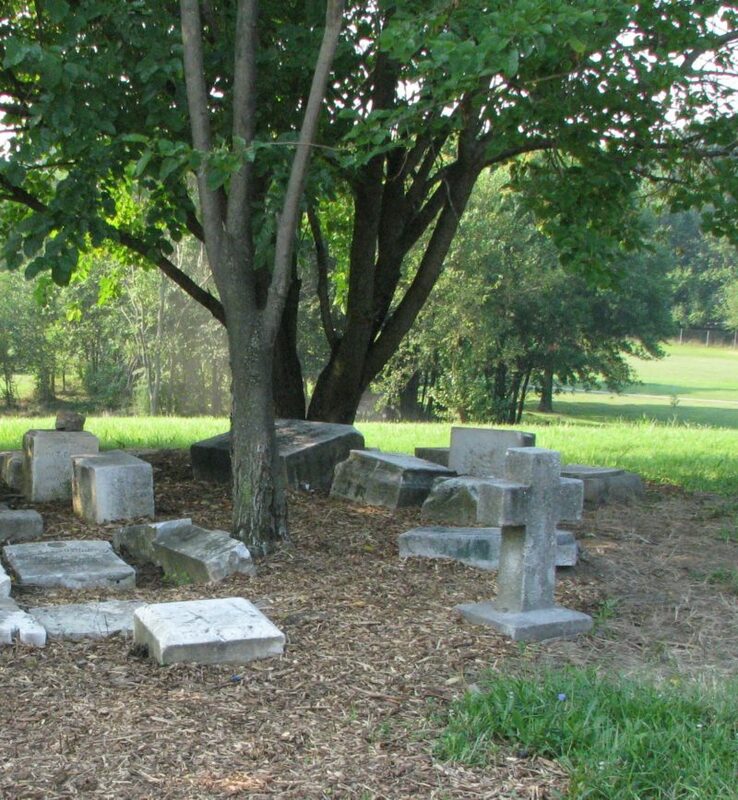 To preserve the integrity of the graves and protect against desecration, the City of Baltimore and St. Vincent’s agreed to dismantle the mausolea, bury the bodies, and remove all tombstones so gravesites could not be easily identified. As time passed, nature reclaimed the hillside and it became overgrown with bushes and weeds. It remained that way for almost 30 years until a small group of descendants found each other and formed a nonprofit organization, the Friends of St. Vincent’s Cemetery, to organize clean-ups (with some of our parishioners have helping), obtain funding, produce a burial census, catalog tombstones, and enlist city maintenance. Read more about their work and about the history of the cemetery at The Friends of St. Vincent Cemetery website. Our parish community is profoundly grateful to the Friends of St. Vincent’s Cemetery for their passion, devotion, and perseverance in restoring our cemetery. In 2012, the group received the Historic Preservation Award from the Baltimore Heritage Society for its work in restoring the cemetery. Our parish community congratulates them!